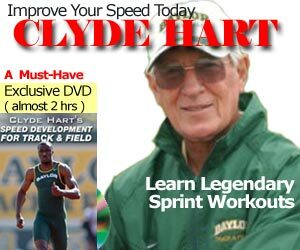 If you enjoyed Vince Anderson’s Sprint Acceleration and Maximum Velocity article, you are sure to enjoy this podcast. Vince Anderson, the assistant coach at Texas A&M University, is a world class sprint, hurdle and relay coach. He has coached a number of athletes to NCAA and US national titles, including Leonard Scott, Jabari Greer, Justin Gatlin, Gary Kikaya and most recently, Muna Lee, the 2008 US Olympic trials champion in the women’s 100m. Prior to his current position at Texas A&M, Anderson established an outstanding coaching record across 16 years at the University of Tennessee. Vince has also coached a number of world class combined event specialists, including 4-time US national champion Tom Pappas. In part one of this interview, Coach Anderson begins by reviewing his history and development as a coach. He then goes into great detail about his training program, including examples of weekly plans in both the general and special preparatory periods. He also talks about some technical aspects of sprinting and the evaluation of technique in general. And finally, his thoughts on the inclusion of various strength parameters, such as maximal and elastic strength, into a training plan rounds out this portion of the interview. In the second part of the interview, Vince gives some great advice on a number of topics related to training and coaching. The matters discussed include his philosophy of combined events training, the training of 2008 American 100m champion Muna Lee, dealing with a major games environment and some highlights of his career. Perhaps most importantly, the methods of planning and periodization which Coach Anderson subscribes to are talked about in great detail. For coaches of all abilities, this interview offers no shortage of valuable information and insight. Here is the podcast from the The Canadian Athletics Coaching Centre.